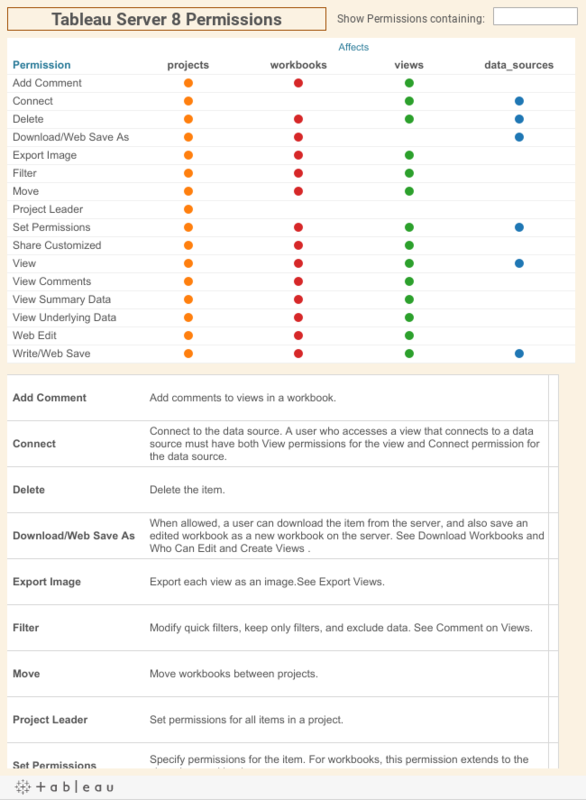 Here's an initial dashboard showing the Tableau Server 8 permissions. There are some additions from TS 7 to enable Web authoring. As usual, the descriptions are truncated to the first 255 characters, an artifact of Tableau's use of the MS Jet engine for accessing Excel and CSV data. I'm planning on creating a proper Tableau Extract for the data using the new extract API, but it seemed prudent to not hold this back for that. Try to put a fake first record (line) with every column containting a string of characters the size of the maximum length to be see in your data set. If the longuest string for the column "Remark" is 5421 characters, put on the first line a string of 5421 characters of your choice (I suggest "x"). You can also sort your dataset so all the longuest string is on the first 20 lines or so. If it's still don't work you can add this registry option to change MSJET behavior. MSJET read only some first lines to guess column length, These registry option tell Windows to read all lines to guess the correct column length. Off course you will have a performance penalty on big Excel file to import, as Windows need to read all lines twice, first read to set correct column length and second to read data into Tableau. Why so stingy with the Site names list?